Covers the forces for involved in the Jacobite Rebellion of Bonnie Prince Charlie. Bonnie Prince Charlie and the Jacobites try again to restore the Stuart monarchy and overthrow the redcoat army of the Hanoverian King. Highlanders, lowlanders and all the panoply of the British army can take to the field once more in this, the final title of the series. Peter has made his living as a freelance illustrator for 40 years, mostly working on historical subjects, notably in recent years for Osprey in the UK, and for various wargame figure manufacturers in the form of box art. 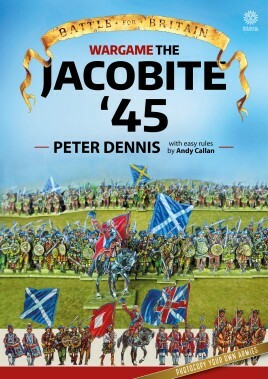 Jacobites were the subject of his first experiments with paper soldiers. He is half-Scottish and the subject has always had a special appeal. Castles formed a major theme in his days as a children's book illustrator so in 'Castle assault' he is returning to his illustrative roots and squeezing as much masonry and siege equipment as he can into the format, alongside Bannockburn and more Scottish heroics. Peter has played with toy soldiers in one way or another for most of his life, and his work and hobby come together in this paper soldier revival project with Helion books. He lives in Mansfield, Nottinghamshire, in the UK. Andy Callan has written many articles in wargames magazines and is renowned for his innovative approach to wargaming.